Molluscum Pendulum are benign flaps of skin. 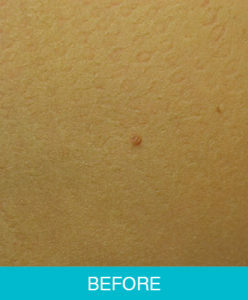 They are usually darker in colour than your natural skin and are often found on the neck and upper torso. Molluscum Pendulums can be flat or protruding flaps of skin. A Molluscum Pendulum can be removed permanently in one treatment. Depending on the number of tags and the size of the tags you can have multiple be removed during a treatment session. When treating small flat Molluscum Pendulum the technician will touch the tag with the tip of her probe while releasing current, the Molluscum Pendulum will dry up and fall off on its own within days. In the case of larger Molluscum Pendulum the treatment time will take longer as there is more preparation for the technician. For larger Molluscum Pendulum the technician will grasp the head of the Molluscum Pendulum with a tweezer, she will lift the tag up exposing the neck of it. With the probe a current is used to cut it off while cauterizing it. If the Molluscum Pendulum are very large only a few may be treated during a treatment. Do not rub or scratch the area. 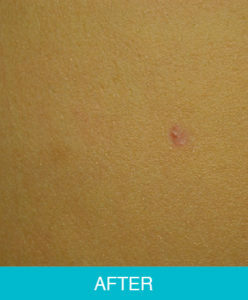 A scab will form post treatment. It is important to let the scab heal naturally. This may take a week or two depending on the size of the Molluscum Pendulum that was removed. It is important to keep the scab dry to allow for proper healing.